In 1991, the U.S. Congress passed the Student Right-to-Know and Campus Security Act, which requires colleges to report the three previous years of crime statistics and campus security information and policies. The act was amended in 1992, 1998 and 2000. In October 1998, President Clinton signed an amendment renaming the act the Jeanne Clery Disclosure of Campus Security Policy and Campus Crime Statistics Act and requiring that crimes motivated by hate or bias be included in the statistics. In 2008, the Higher Education Opportunity Act added additional requirements for reporting, including but not limited to: emergency response and evacuation procedures, expanding the list of crimes motivated by hate or bias, reporting of fire safety information, and establishing a missing student notification policy. The University of Kansas recognizes the importance for an institution of higher learning to develop and maintain a safe and secure environment in which the academic and social pursuits of its members can be fully realized. The university has the utmost concern for the success of each student and endeavors to allow each student maximum freedom to live his/her life free from interference. With this freedom, however, each student is responsible to be an active participant in the exercise of personal safety. While the University of Kansas strives to provide a safe environment, criminal incidents and other emergencies may occur despite reasonable efforts. No community's security plan can attain maximum effectiveness unless everyone contributes to making it work. Safety and security are both personal and shared responsibilities. The university encourages all crimes to be reported to the Overland Park Police Department and the Edwards Campus administration. By accepting this responsibility members of the university community foster a safe and secure academic environment. Both KU Public Safety and the Office of Institutional Opportunity and Access can investigate cases of sexual assault and harassment. In an emergency, dial 911. 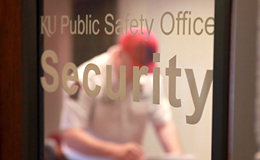 To reach Public Safety in non-emergency situations, call (785) 864-5900 or visit publicsafety.ku.edu. IOA can be contacted at (785) 864-6414​ or ioa.ku.edu.